Rolfe Judd are proud owners and custodians of Ardwina, a Thames spritsail barge. Ardwina can often be seen out on the River Thames in London, on the Estuary or on the River Orwell in Suffolk. She has been part of the company for nearly 40 years and our staff and clients have enjoyed numerous relaxing trips, which provide a different view and perspective of our city. Our London excursions generally start from St Katharine Docks or London Bridge City Pier and can sometimes include a passage under Tower Bridge and downstream to Greenwich and the Thames Barrier. Built in 1909 and so now well over a hundred years old, Ardwina was the last wooden barge to be built by Orvis & Fuller in Ipswich. Originally owned by EJ&W Goldsmith of Colchester, Ardwina initially worked in the Thames Estuary and along the South Coast, carrying stone between Portland and Greenwich. There then followed a period of near disaster, in 1938 she was dismasted and left to drift in a channel gale. Then later, after WW2, in 1955, she was in collision with a Dutch coaster in the Thames. Ardwina was saved by Daniel Bros of Whitstable and consideration was given to converting her to a motor-barge. Her bow and port side were repaired but no engine was installed and she lay in Whitstable until being sold in 1959 for use as a private yacht. She became a houseboat throughout the 60’s and 70’s in Chelsea Reach, Battersea and later in Maldon, Essex. Ardwina was purchased by Rolfe Judd in 1979 and returned to Dock End Yard in Ipswich to be restored. 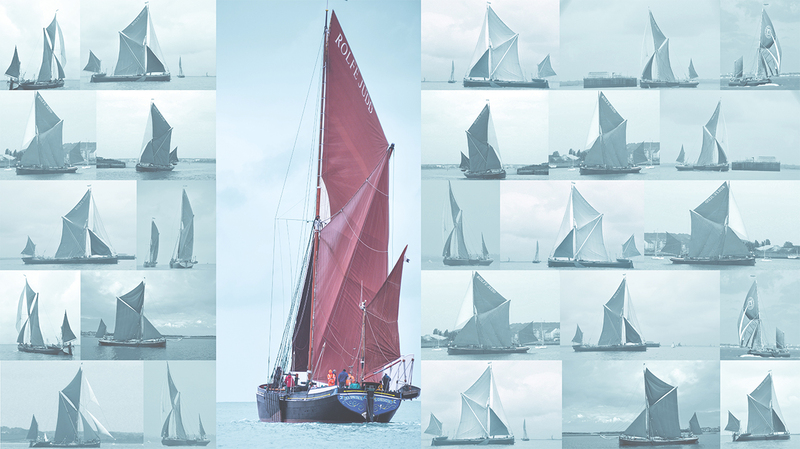 After restoration, including the installation of an engine, she started racing, winning many Thames Sailing Barge Matches. In the intervening years there have been many trips back to yards on the east coast for repairs and replacement parts, including new decks. Nowadays, she takes life easy, dividing her time between St Katharine Docks and her home in Ipswich, lovingly attended to by her master, Gordon ‘Willie’ Williamson.